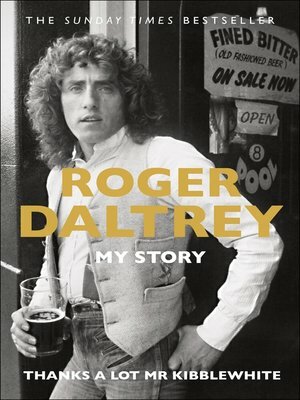 "It's taken me three years to unpack the events of my life, to remember who did what when and why, to separate the myths from the reality, to unravel what really happened at the Holiday Inn on Keith Moon's 21st birthday," says Roger Daltrey, the powerhouse vocalist of The Who. The result of this introspection is a remarkable memoir, instantly captivating, funny and frank, chock-full of well-earned wisdom and one-of-kind anecdotes from a raucous life that spans a tumultuous time of change in Britain and America. Born in the heart of the London Blitz in March 1944, Daltrey fought his way (literally) through school and poverty and began to assemble the band that would become The Who while working at a sheet metal factory in 1961. In Daltrey's voice, the familiar stories—how they got into smashing up their kit, the infighting, Keith Moon's antics—take on a new, intimate life. Also here is the creative journey through the unforgettable hits including My Generation, Substitute, Pinball Wizard, and the great albums, Who's Next, Tommy, and Quadrophenia. Amidst all the music and mayhem, the drugs, the premature deaths, the ruined hotel rooms, Roger is our perfect narrator, remaining sober (relatively) and observant and determined to make The Who bigger and bigger. Not only his personal story, this is the definitive biography of The Who.